The Best Bird Feeder For Cardinals, Chickadees and Finches. This bird feeder is equipped with patented Squirrel Buster design. 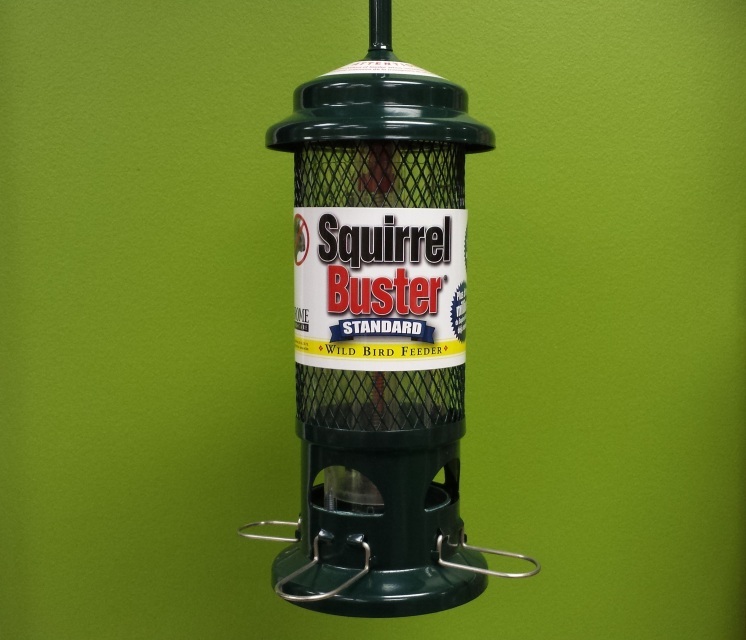 Squirrel Buster Standard Wild Bird feeder is made of innovative solution how to attract birds and deter squirrels. This bird feeder has a capacity of 3/4 quarts of bord food. It can hold all types of seeds, depending on the birds from your local area. This Brome Wild Bird Feeder will be a welcome choice for bird lovers. It will attract a large number of bird species, perching as well as clinging will love it. This is great American Gold Finch, Woodpeckers, Chickadee, and best bird feeder for Cardinals. Different birds will come for different type of seed. This feeder is squirrel proof, there is openings in the bottom of the mesh shroud at the seed tray, where the birds access the seed. If a squirrel jumps on the feeder, the weight will force down the shroud, and the access closes automatically. This prevents the squirrels from accessing the seeds but do not harm them. If the squirrel jumps on it, the mechanism will be closed by the weight of the squirrel. This looks like a good design and this and other Brome bird feeders, and works well. Most of the Brome Wild Bird Feeder come with this technology and by researching I have found that most of the people are finding it working very well. You can easily place it next to your window, so you can do some bird watching from your home. This squirrel proof technology will save you some money, as lots of seed is wasted by squirrels. If you use it up year-round this can come to quite a bit of money that you can spend for something else. This feeder comes with a weight-adjustable mechanism, this you can experiment and adjust to your liking if you don’t want larger bird types to come to your feeder. This is a good way to target what birds you want to feed. That way you can setup the mechanism the way you like it. If you want to increase the setting rotate the green color dial clockwise. Now the red indicator is going to go in the opposite direction than before, it will go down. 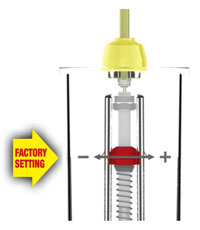 When it goes down it will increase the tension on the feeder spring. By this action the weight that is required to close the mechanism is set higher. 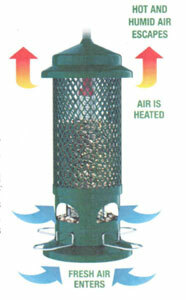 For this Brome Wild Bird Feeder there is the same simple rule, the squirrel must place its full weight on the feeder to activate the closing mechanism. 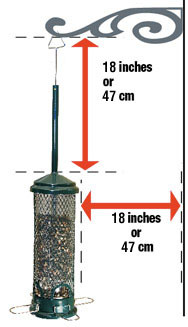 So place it at least 18 inches or 47cm away from objects that squirrels can use to jump on the feeder. Simple as that, if it is on the feeder, the squirrel shuts itself out from the prize. The feeder is designed with a clever negative grip tube, to prevent squirrels from hanging down alongside of the feeder and stealing the food, and defeating this closing mechanism in that way. If a squirrel comes from top of the feeder and cling with his back legs it can get the seed and not activate the closing mechanism, by designing this negative grip tube this prevents the squirrels from doing such a stunt. What ever way the squirrel try it cannot escape this. This design is made with a good ventilation system, that lets a hot and humid air escape from the middle. This is done with vents on the top of the bird feeder. Fresh air enters from the bottom, and the keeps the seed fresh. The birds are feed with dry and healthy food. There is a lot to be said about a need of a good ventilation system. If the seed gets damp and rots, the mold grows and spoils the seed, you don’t just lose money by buying more seed, but you put the birds in danger from poisoning! There is no perfect ventilation system, so check the Brome Wild Bird Feeder to see if there is some mold inside, and clean it from time to time. I think if you have lots of rain or snow it is good to check more than in summer when it is dry weather. If you live in a area where is high humidity then check it also. This ventilation system works good, and looks like this problem is minimum. What birds will this feeder attract? Lots of birds like Woodpeckers, Titmouse, Chickadees, Nuthatches, Tanagers, Sparrows, Finches will come often to visit, it is the best bird feeder for cardinals. You can check the bird seed type section to see what seed will attract desired birds to your yard. This bird feeder in doing what is advertised. The size is its only minus. This feeder is on the smaller size compared to the other brome feeders on the market, this can deter some users that want more capacity and less refilling. You will have to refill it every other day if birds are visiting a lot, some may find it not attractive because of this. This bird feeder is dishwasher safe, and can be washed mechanically. You can detach the components for easy access and cleaning. Color and material will not show wear and tear even after prolonged exposures or squirrels attack. Bird feeder will not rust when left on rain or snow. And can be left outside safely. I also found that if the Squirrel Buster Standard Wild Bird feeder is not cleaned regularly the sliding mechanism gets stuck up with seed dust and humidity which sometimes can get the closing mechanism to get jammed, so clean the feeder from dust and dirt. This will prevent the mechanism from getting stuck and then bird cannot get to the seed. 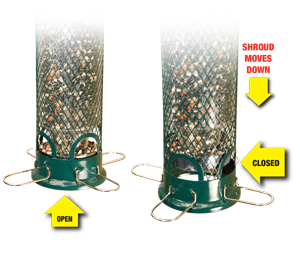 The standrard Brome Wild Bird Feeder hangs easily with an extension hook. It can be placed next to a tree, or close to a window for bird watching. It is recommended to place it at least 16 inches (40 cm) from a nearest branch or place where squirrels can access it. This prevents them from reaching it without placing its weight on the feeder. That way the squirrel is forced to climb on the feeder and activate the closing mechanism. If you place the bird feeder away from objects that squirrels use to jump on it you minimize the chance of squirrels knocking it down and spilling the seed around. The feeder is not going to get damaged but you will lose the seed. Make sure to clean the bird feeder once a week to make sure no mold or similar things grow on it, as birds can spread disease. In case of ice or snow falling on the bird feeder, this can push the closing mechanism down, and shuts the openings and the birds from the food. So if you have large chunks of ice hanging from the feeder shake it off. If the ice is left to accumulate the closing mechanism can get stuck. This happens if rain falls over night and freezing temperatures follow. This can also happen with the seed, if it gets wet in low temperatures, then it can get stuck and stops flowing from the holes and the birds cannot eat. You can easily see if the bird are not eating and fix this. Some people have reported that if there is too much dirt and seed dust on the feeder the closing mechanism gets stuck, but this is easily preventable by regular cleaning once a week. If you have lots of bears or raccoons in your area , this can become a problem, these animals are relentless when they see food, and will attack bird feeders. You can just remove the feeder over night if bears are your visitors, as these large animals can destroy it at ease.